Brokers Data offers direct mail leads, direct mail lists, services and solutions that include a full range of products such as post cards, self enclosed snap packs and every other direct mail option available. We can drop your mail campaign for as little as .65 cents out the door! Choosing the right direct mail partner has been made easy since Brokers Data is a one stop direct mail solution. Not only do we offer creative mail pieces but we can also pull the strategic and targeted fresh mailing list that is critical to making your mailing campaign a success. We can handle everything from your mailing list selection, insertion, printing, postal qualifications, postage and every other task that needs to be completed prior to launching a successful direct mail campaign resulting in qualifird direct mail leads. Selecting a direct mail vendor who can accomplish everything for you with one call is a huge advantage and certainly a cost and time saver. Make sure you give us a call before launching your next direct mail project. 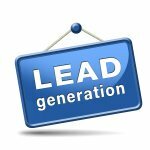 We will be happy to do a free consultation with you to help you successfully generate your direct mail leads. We have all sizes of postcard mailers available. Whether you are looking for 4x6, 5x7, 6x8 or larger custom sizes, we can meet your needs. Some postcard options include but are not limited to full gloss, UV coated, black and white, five color and more. We also offer a snap pack self mailer that is the size of a post card but is better suited for sensitive offers that may be best delivered privately versus the full exposure a postcard gives. Postcards offer less postage costs so they are great money savers but the drawbacks are the limited amount of advertising space. You can rely on Brokers Data for the proper guidance regarding not only the selection of your mail piece but also the selection of your lists, tracking and all post office compliance issues. This is the Brokers Data advantage and we will exceed your expectations of what you expect from a direct marketing and mail professional. 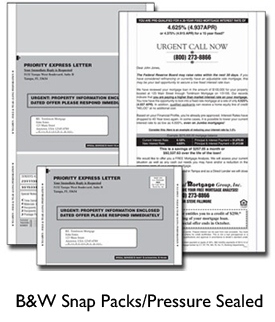 Self-enclosed mailers are described as being an in-between sized mailer of a full sized envelope and a postcard. You can choose the size of the self-enclosed mailer which is folded on 3 sides and then sealed. When opened, the postal information is on the back of your customized self-enclosed letter containing your offer or services. The more popular version is called a snap-pack and may be slightly higher in cost but can be as small as a postcard or as big as a legal sized document. The snap pack contains the letter (offer) which is sealed on all sides. There is a perforation included on one side of the mail piece that makes it easy to open. Once opened, the mailer can be peeled back to expand to its full size. The look of a snap pack is similar to other important or official mailings such as paid property tax receipts, bank and brokerage notifications, mailers containing debit/credit cards or government issued notices or checks. The full sized letter has traditionally been a great way to send formal requests or notices and generate direct mail leads. Due to the bulk of a consumers personalized mail being delivered using the full-sized letter format, the consumer pays special attention to these letters especially if they are sent using first class postage. Adding messages on the outside of the envelope can also be very effective in getting your open rate percentage up, but pay close attention to the content of the message. It can have a direct influence on either getting the recipient to open your mail piece or "round filing" it never allowing your marketing message to see the light of day. In most cases, our advice would be to not add a marketing message on the outside of your envelope since the curiosity factor may result in a higher opening rate. With this being said, once opened, you must capture the attention of the recipient quickly. We must assume that your targeted consumer is not going to take the time to read your complete offer unless something captures his/her attention and quick. 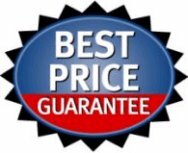 Your offer must have a "hook" as we call it to draw the prospective customer to your product or service. Make sure to highlight what makes you different and how will the recipient benefit from doing business with you. The larger sized legal letters and oversized mailers are a great way to build interest and using long form letters have been known to generate a huge response rate. It is important to consider your prospective customer and your offer. If you have many products to offer, then it makes sense to use catalogs to showcase your many products, styles and price points. If you have one or a limited number of products but they may be complex in nature, then using a multi-page or over-sized mailer would be an advisable choice. Using a multi-page mailer will work well with high end clientele or for use with your internal company customer or client database. Using a catalog will effectively capture new potential customers and acts as your salesperson giving detailed descriptions of products you offer while generating the necessary interest to get orders sent or called in. Specialty mail pieces include anything that is outside of the normal parameters and sizes that we would normally see in our direct mail. Specialty mail pieces are anything other than the standard postcard, self-enclosed mailer, envelope or letter. These specialty options are more expensive than the usual direct mail options, but sometimes the additional expense may be a profitable tradeoff it increases your response rates. Be sure to contact Brokers Data for the support and expertise to generate the high performing direct mail leads you and your sales team have come to rely on. Don't forget to inquire about our Turn Key Direct Mail Leads campaigns.